London dispersion forces arise because, at any given instant, there may be more electron density at one end of the molecule than at the other. 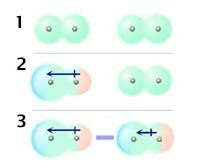 In any molecule, electrons are always moving. At any given instant, they might be at one end of the molecule. Even if the molecule were nonpolar, this would instantaneously create a temporary dipole. One end would become negative and the other end positive. The positive charge attracts the electrons in an adjacent molecule. This temporary attractive force is the London dispersion force. The London dispersion forces in a nonpolar molecule like methane are so weak that it does not condense to a liquid until it cools to −161.5 °C.